Sunday was a beautiful day, it was the first day the sun has been warm this year, and although it wasn’t hot enough to think of barbecues, it was hot enough for ice lollies. I decided to have a look in the freezer section of Aldi to see what was on offer, and the Latte Macchiato seemed to shout ‘buy me’ at me. Lets face it if I had to categorise my top favourite flavours; chocolate, coffee and nuts would all be in my top five, so how could these ice-creams possible go wrong? There were three in the box for the rather remarkable price of £1.49. 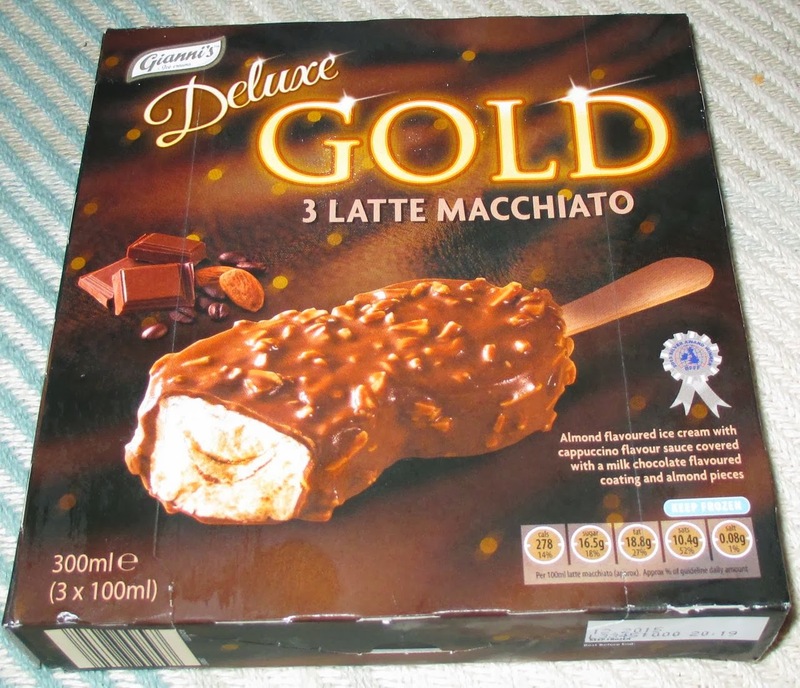 I saw from the packet that these Giannis Ice-cream had won an award, so it was all looking good. The ice creams looked to be a good size when I opened them with a generous helping of almonds pressed in to the chocolate case. They were shaped a little like figures of eight. I took my first bite and found myself a bit confused, I went back to check the box to ensure I’d picked the coffee edition, and it clearly stated Latte Macchiato on the packaging. Why was I tasting a plain filling with a chocolate and nut shell? I thought for a moment that perhaps it was like a proper Latte Macchiato where there are layers of milk with a sharp espresso in the middle, and that maybe I’d find my coffee fix further down. Sadly not, the sweet creamy flavour carried on throughout. Now here is the thing, cream, chocolate and nuts works really well, and so my taste buds were quite happy. It was a rather enjoyable treat in that respect and lovely on a sunny day. However if you are going to say Latte Macchiato on the pack please give me some coffee flavour too. The only hint of coffee I had throughout the entire ice cream was when I had finished it, and there was this vague flavour left on the palate like I’d drunk a cup of coffee about an hour before. I’m not sure if I just got a duff batch, or whether they are supposed to be like that - but if it if going to promise coffee it needs to deliver. Look how far down coffee is on the ingredients list, bearing in mind they are always ordered by the ingredient with the largest quantity first, its 23rd on the list. I’m just hoping the peanut box I picked up at the same time has a bit more flavour. How disappointing that the coffee doesn't show through!